Since 2013, Save the Sound has worked to improve the health of the Pequonnock River—which drains land from Monroe to Bridgeport—with restoration projects that prevent polluted rainwater runoff and improve the ability of alewife, blueback herring, and other migratory fish to swim from source to Sound (and back again). Rivers like the Pequonnock are especially vulnerable to the impacts of urbanization. Cities are full of pavement and other surfaces that prevent rain water from soaking into the ground. Instead, rainwater runs off of buildings, flows over roads and sidewalks, and picks up what humans and animals leave behind: trash, oil and grease, fertilizers, and pet waste, among other things. 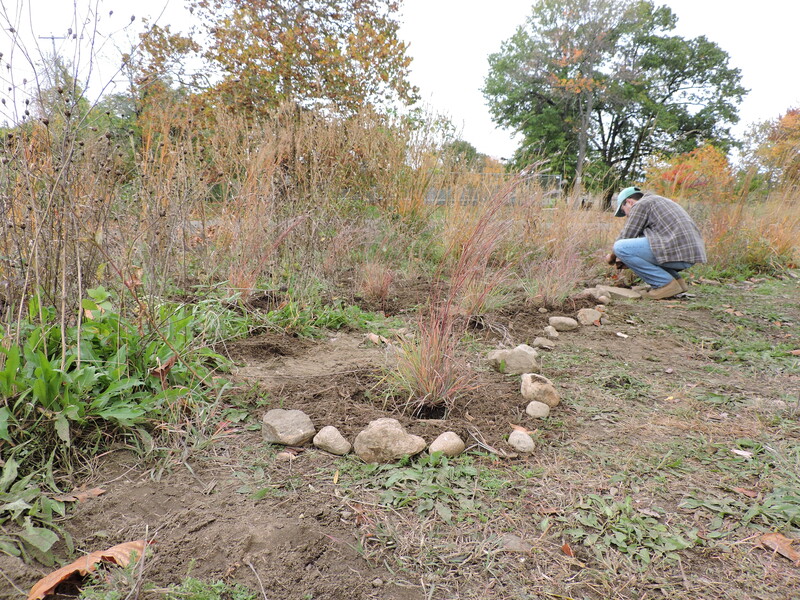 In Bridgeport, Save the Sound is restoring streamside habitat with native plants and building rain gardens and other natural, green infrastructure to reduce pollution from stormwater runoff and restore and revitalize the Pequonnock River. What follows is a personal account of Save the Sound’s most recent effort along the Pequonnock from Ariel Shearer, Outreach and Development Associate. 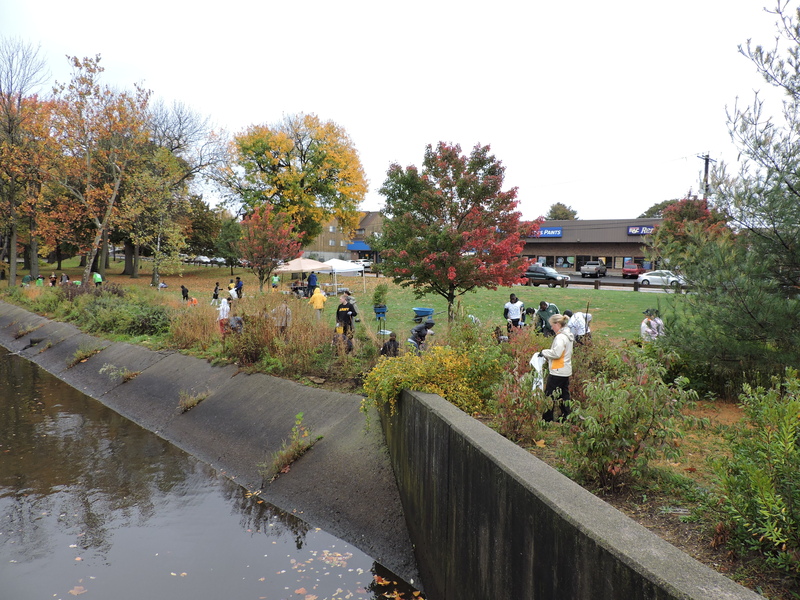 On a gray Saturday in October, the Save the Sound Green Projects team set out to reinforce Pequonnock River revitalization efforts at Bridgeport’s Glenwood Park with a volunteer planting event. We drove down highways lined with colorful foliage on our journey from New Haven to Bridgeport, red and yellow leaves burning bright against the drab backdrop of the sky. My heart nearly skipped a beat when I saw the first drops of rain smack the windshield. “Who’s going to come out and volunteer in the rain?” I wondered. But Kendall Barbery, green infrastructure program manager for CFE/Save the Sound, quickly set my mind at ease. “We need it,” she explained, telling me how Connecticut is in a serious state of drought and has been for the past six years. She told me how rain softens the soil and makes it easier dig, and reduces the need to water the new growth. I zipped up my raincoat with a renewed sense of purpose as we passed over rivers flowing lower than they should. The rain picked up as we arrived at the park, pulled on our boots, and began unloading 100 potted plants — native grasses and shrubs — from a truck parked along a busy roadway. Curious drivers looked on as we separated the plants by species and stacked towers of mulch and compost while the ground around us turned to mud. Just as it started looking as though the weather would have the Save the Sound team planting alone, volunteers from Viridian, a local green energy firm, arrived wearing rain coats and ponchos over their bright green t-shirts. Slowly, the day’s planting crew grew. Volunteers huddled under canopy tents, bundled in rain gear and gloves, as Anna Marshall, Green Projects Associate, introduced the day’s project and passed around photos depicting the planting site at various stages of development. It was just weeks ago that I first explored the riverbank in the hot summer sun, inspecting thousands of native grasses and shrubs planted by Save the Sound volunteers in the spring of 2014. Back on the riverbank in pouring rain and wind, I found myself warmed with gratitude for the hearty group of volunteers who braved the weather to tend this indispensable riverside garden. Volunteers from BuildOn Bridgeport, the Easton Cub Scouts, the Bassick Lions football team, and other groups quickly settled in with shovels, trowels, and buckets to bring new life to the riverbank. I watched as a little boy taught himself how to pull a plant from a pot, and an older boy taught his teammates how to dig a hole, twice the size of a new plant. Even the sun made an appearance as the group picked up trash, planted shrubs, and removed invasive species like bittersweet and pokeweed. 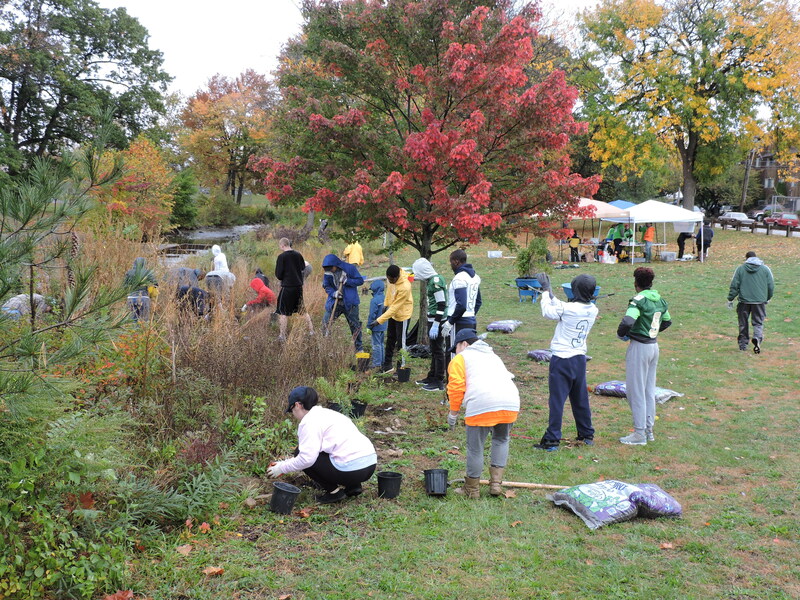 “Planting native perennials along the banks of an urban river benefits more than just the Sound—this colorful oasis of grasses, shrubs, and trees beside a busy stretch of highway and along a concrete lined section of the Pequonnock River has a lot of educational value, too. 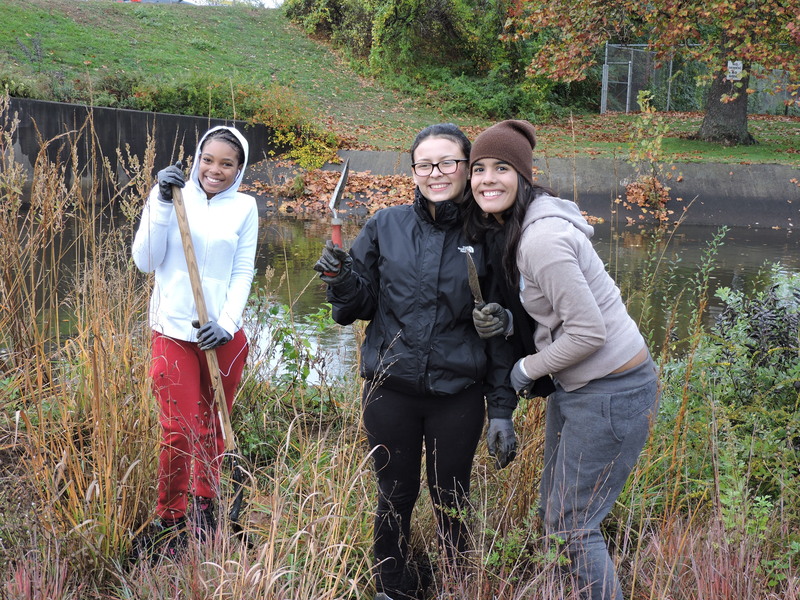 Every volunteer that braved the weather today got a hands-on opportunity to learn about the role that native plants play in reducing stormwater runoff and restoring the Pequonnock River and Long Island Sound,” Kendall said. 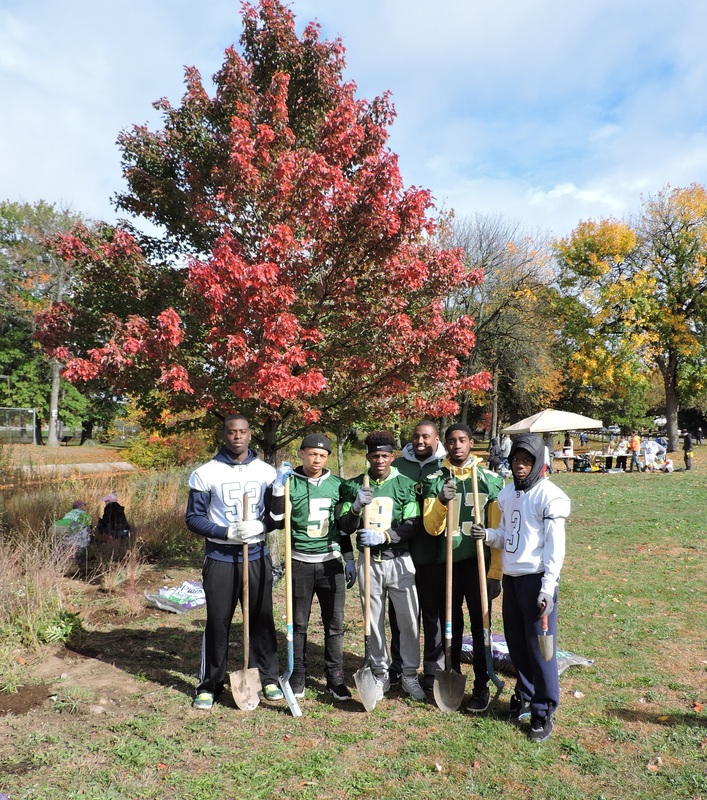 Urban restoration plantings, rain gardens, and other hands-on projects help Save the Sound engage and educate our community about steps we can all take to protect and restore the Sound and its tributaries. Just last month, a multi-generational group of a dozen volunteers, including Save the Sound members and Beardsley Zoo Conservation Corps students, learned how to plant a rain garden during a workshop at the Beardsley Zoo, about a mile upstream from Glenwood Park. Oliver Gaffney, who helped design the original planting, arranges rocks to protect new growth. The Beardsley Zoo project, which includes a walkway and rain garden that work together to soak up and filter parking lot runoff before it reaches the Pequonnock River, broke ground back in April. After the heavy lifting wrapped up in mid-May, youth from Groundwork Bridgeport, the Mayor’s Conservation Corps, and the zoo’s Conservation Discovery Corps and Explorers came together to plant native perennials in the rain garden and to plant trees in other spots surrounding the parking lot. 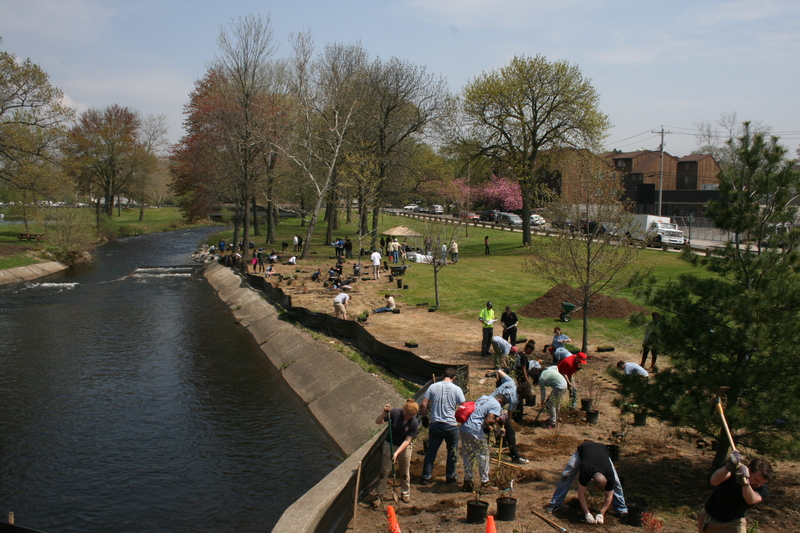 Save the Sound’s Pequonnock River restoration efforts at Glenwood Park started even earlier, with the 2013 installation of a fishway through a concrete apron that had impeded fish migration for years. The fishway has helped increase fish population by providing a safe pathway for alewives to swim upstream and spawn, offering a healing benefit to the entire Pequonnock River ecosystem. 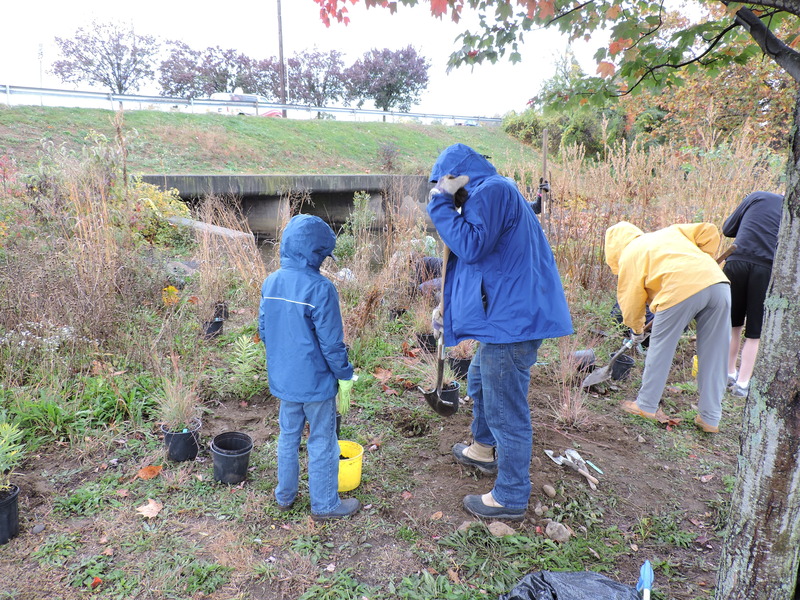 Efforts continued in 2014 with a riverside plant-a-thon at which local youth and other volunteers put 2,100 native plants into the ground along the Pequonnock River – the site of our rainy day revitalization planting. The Bassick Lions football team. 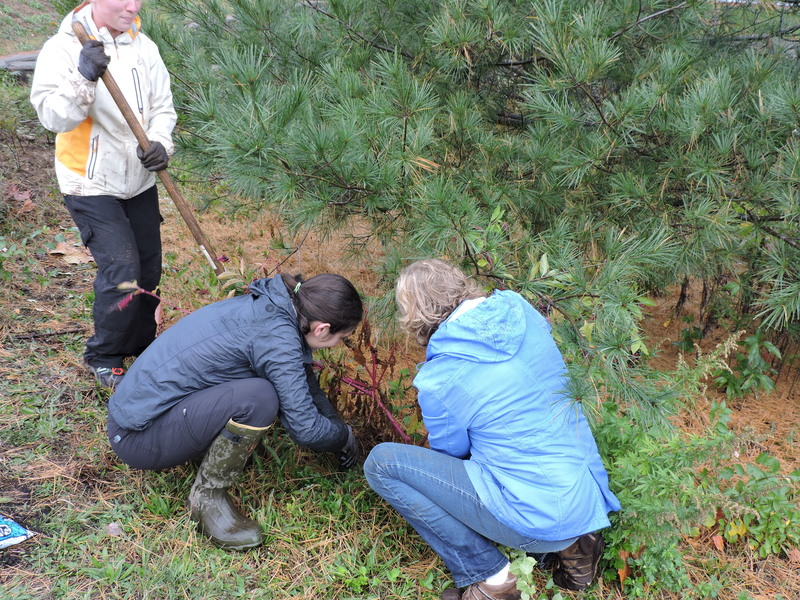 Marlee Najamy, an environmental scientist who works in Trumbull, originally participated in the 2014 plant-a-thon and came out again to participate in Saturday’s event. She was excited to see how the plants had progressed over time. “It looks amazing—you can clearly see that some plants are doing really well,” Marlee said. The addition of new riverside plants will help further stabilize the riverbank and create additional habitat for birds and other pollinators. These new plants will also help filter hundreds of thousands of gallons of stormwater runoff a year, preventing pollutants and debris from reaching the Pequonnock River and reducing the amount of nitrogen and bacteria in one of many waterways that drain to Long Island Sound. Buffer plantings additionally deter troublesome geese from flocking on the riverbank and help filter the bacteria-laden waste they leave. Excess nitrogen pollution contributes to low-oxygen dead zones (think: dead fish and sea turtles) and is currently the leading water quality challenge in Long Island Sound, emphasized in the Long Island Sound Report Card released by Save the Sound earlier this month. Thank you to Trader Joe’s in Orange and Stop n’ Shop in Fairfield for generous —and delicious —food donations! Work to restore the river and its banks has been funded by the National Fish and Wildlife Foundation’s Long Island Sound Futures Fund, Long Island Sound Study, CT DEEP, Restore America’s Estuaries, NOAA, and the Jeniam Foundation. This post was written by Ariel Shearer, Outreach and Development Associate for CFE/Save the Sound.